Hartlepool United will be looking to halt their decline when Dagenham & Redbridge visit the Super 6 Stadium on Saturday - but what should Pools expect? A nine-game winless run saw the club part company with Matthew Bates earlier this week, with Craig Hignett taking temporary charge of this National League clash. 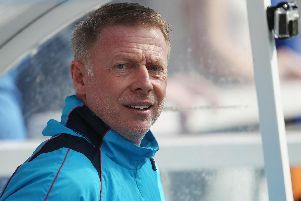 But what should Pools' temporary chief expect from the Daggers? What system will Dagenham & Redbridge play? Similarly to how Pools lined-up in the early weeks of the season, Dagenham tend to operate in a 3-5-2 formation. Their attack-minded wing backs ensure the side offer plenty of width while the three centre backs provide a solid base to build from. Some creative midfield players help feed a strong forward line that boasts some excellent EFL experience. Who are Dagenham & Redbridge's key players? There will be two familiar faces in the Daggers' squad at the weekend who will be keen to make their mark as they return to the North East. Ex-Poolies Jack Munns and Tomi Adeloye could both feature for Dagenham with Munns having been a regular this campaign. Striker Angelo Balanta offers a real threat in front of goal and will need to be watched carefully, while wing-back Alex McQueen is a former Tottenham prospect who has looked lively this campaign. Conor Wilkinson offers some vital experience of a higher level and has four goals to his name already this campaign, and he will likely be the main goal threat that Hartlepool will need to be way of. Do Dagenham & Redbridge have any injury worries? Dagenham have no fresh injury worries, meaning they could opt to name an unchanged side from the one that beat Havant & Waterloovile last weekend. Who is Dagenham & Redbridge's manager and what can we expect from them? The vastly-experienced Peter Taylor is the man in charge of the Daggers, having taken over earlier this year. A former England caretaker manager, Taylor also took charge of the national team's under-21 squad on two occasions. His knowledge and know-how will undoubtedly prove key as Dagenham look to climb the National League table after a slow start. What form have Dagenham & Redbridge been in? The Daggers are one of the form sides in the National League, having won five of their last six games in the division. That upsurge in results followed a five-game losing run which saw them plummet down the table. But things are looking up for Dagenham now as they aim to build on their current 17th place standing.